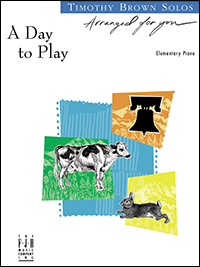 These playful, spirited pieces are based on Korean folk songs and arranged for the elementary pianist. Timothy Brown's arrangement of this American traditional children’s lullaby is hauntingly beautiful. There is a minimum of moves, and the optional teacher duet adds just the right touch for a sophisticated ensemble performance. 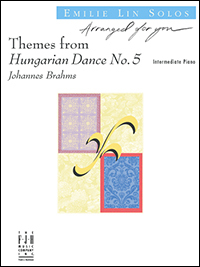 This arrangement of Brahms Hungarian Dance No. 5, written for the intermediate student, captures all the famous themes without losing any of the original's drive and spirit. A wonderful introduction and invitation to Brahms' style and energy. Easy to learn and always a crowd pleaser. A beautiful arrangement of the classic piano concerto for the intermediate level student, this piece includes hand crossovers with L.H. playing flowing, arpeggiated chords for one of the themes. The opening begins with the main theme in a dotted half two eighth note rhythm and finishes with a triplet quarter rhythm that is both aesthetically pleasing for the ear and also challenging to play. 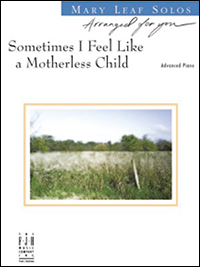 A lovely tribute to the United States, this poignant solo features moments of hope and great beauty. 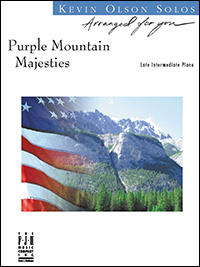 America, the Beautiful includes colorful harmonies, a singing right-hand melody, rubato playing, legato pedaling, a wide range of dynamics, and right-hand and left-hand octave playing. 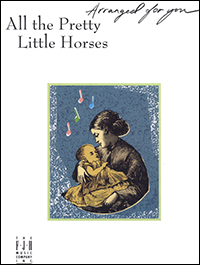 Arranged for the late intermediate student, this richly moving setting of an African-American Spiritual is full of sweeping arpeggios and rich harmonies. 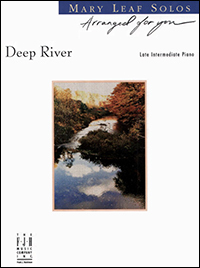 With the vast variety of expressive markings included throughout this arrangement, the late-intermediate pianist will have many artistic opportunities to express their own interpretation. 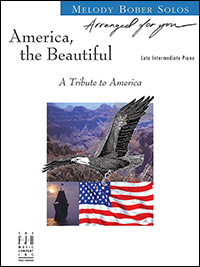 This fresh, modern interpretation of America the Beautiful is perfect for a patriotic event or recital. It is in 6/8 meter and starts with majestic chords in D Major; then moves to a rolling bass pattern and modulates to E Flat Major by the end. 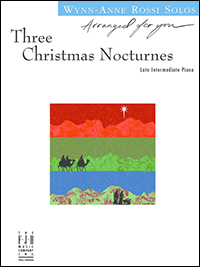 Both late intermediate students and more advanced pianists will enjoy playing these three Christmas nocturnes for recitals, holiday get-togethers, and church services. 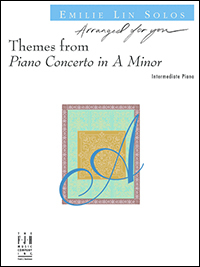 These artistic arrangements contain harmonies that are not always predictable, but yet are interesting and musically pleasing to both the pianist and the audience. 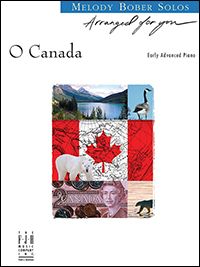 This piano solo arrangement of Canada's national anthem has a big, orchestral sound, with open, arpeggiated chords, sometimes hovering above, other times supporting the melody. The final section moves from 4/4 into 6/8 time, making room for rising triad inversions, and a sweeping 32nd-note cadenza. 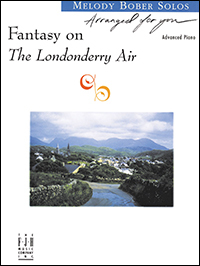 Written for the moderately advanced performer, it is a worthy recital piece that is sure to be a winner both in Canada and the United States. A lush, powerful arrangement of this timeless melody. Expression ranges from the delicate to the dramatic. This lovely spiritual is arranged for advanced students and consists of sixteenth note patterns in the L.H. while the R.H. plays the melodic line ranging from single notes, to double notes, and chords. The middle of this piece changes key and also provides a change in material in a rubato style. This would be a great piece for a recital or other multicultural event.